Common Article 1 of the Geneva Conventions obligates states “to respect and ensure respect” for international humanitarian law “in all circumstances”. According to custom and state practice this is understood to mean that states must themselves abide by the spirit of the norms established in the treaties (“respect”) and encourage others—both states and non-state actors—to do so too (“ensure respect”). However, according to the International Committee of the Red Cross (ICRC), Common Article 1 is “not a loose pledge but a commitment vested with legal force.” This was confirmed by the International Court of Justice in Military and Paramilitary Activities in and against Nicaragua. A review by ICRC Legal Advisors, for example, notes that the language in Common Article 1 not only requires states to “to avoid encouraging … violations committed by others, but also to take measures to put an end to on-going violations and to actively prevent their occurrence.” The official 2016 ICRC Commentary states that this extends to preventing “violations when there is a foreseeable risk that they will be committed”—this would obligate states to condemn deterrence doctrines which rely on the “foreseeable risk” of nuclear weapons being used. The Commentary also notes that states have a duty to ensure respect by all parties to a military alliance. If one NATO member joined, they would thus be required to communicate respect for the prohibition on nuclear weapons to other NATO members.5 The ICRC states that the phrase “in all circumstances” extends the duty to ensure respect into both wartime and peacetime and binds to states to comply with humanitarian norms, no matter what other states are doing.6 This would further undercut the doctrine of nuclear deterrence, by requiring states to uphold a prohibition on nuclear weapons even when threatened by other states’ nuclear weapons and even when nuclear weapons deployment is claimed to be a peaceful and defensive posture. Article 21 of the Convention on Cluster Munitions (CCM) offers a more specified example of what is, in effect, a modified ensuring respect clause. It requires states parties to “encourage States not party” to join the treaty, “with the goal of attracting the adherence of all States” (CCM, Article 21.1). It also requires states parties to notify other states not party of their obligations, “promote the norms it establishes” and “discourage States not party to this Convention from using cluster munitions” (CCM, Article 21.2). While other parts of Article 21 are problematic, these first two paragraphs could serve as a good model for specific language on norm promotion in the nuclear weapon ban treaty. They offer a precedent for including a respect clause in a humanitarian disarmament treaty. 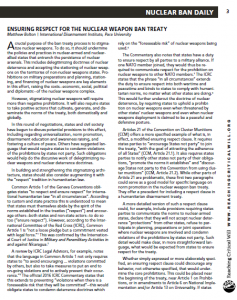 A more detailed version of such a respect clause could, for example, include provisions requiring states parties to communicate the norms to nuclear-armed states, declare that they will not accept nuclear deterrence “protections” from other states, refuse to participate in planning, preparations or joint operations where nuclear weapons are involved and condemn violations of the prohibitions by states not party. Such detail would make clear, in more straightforward language, what would be expected from states to ensure respect for the treaty. Whether simply expressed or more elaborately specified, an ensuring respect clause could discourage any behavior, not otherwise specified, that would undermine the core prohibitions. This could be placed near the beginning of the treaty, near Article 1 on Prohibitions, or in amendments to Article 6 on National Implementation and/or Article 13 on Universality. If states opt for a more general phrasing, they could read into the negotiating record that they understand it to mean that deterrence doctrines are contrary to the object and purposes of the treaty and should be addressed in national legislation and policy.